How to use Mini Trampoline? Exercising is vital to maintaining a healthy body image and staying in shape. Nonetheless, if you’re not cut out for the gym or running 5 miles a day doesn’t seem to be your cup of tea, you may find it challenging. Not everyone is super excited about fitness, and it’s only right since we are all different. Even so, one thing is for sure - this doesn’t minimize the importance of staying fit. In this direction, finding the best mini trampoline might be down your alley. This gear is an exciting and fun way of exercising. Is Jumping on a Trampoline a Good Form of Exercising? What Muscles Does a Mini Trampoline Work? The small size makes it easy to fit in any room while providing you with plenty of exercising alternatives. You can use it to enhance your cardio, abs, leg muscles, back, or glutes. So, we scrutinized the market in search of the best mini trampoline; hence, we will introduce you to our informative fitness trampoline reviews. Before we present our top picks, we will like to cover some of the main questions one may have when it comes to the use of trampolines for working out. Firstly, you should note that not every mini trampoline can be folded for convenient storage. On that note, if your living space is limited, and you intend on putting the trampoline away whenever you’re not using it, you should consider this feature during your search. As a general rule, mini trampolines tend to be around 36 inches in diameter. That means you ought to have at least 40 inches at your disposal so that you could easily utilize the gear. Also, bear in mind that you should ensure you have sufficient storage space at your disposal. If you don’t have enough room, the trampoline may get damaged. 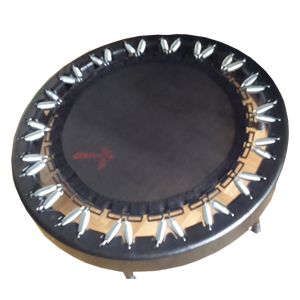 At first sight, most mini trampolines appear the same in size and design. Still, it’s noteworthy that the weight capacity depends on each model. So, this is a quintessential aspect that shouldn’t miss your attention. Failing to consider the weight limit of the gear may lead to serious injuries. Concurrently, the area of the surface should be taken into account as well. Trampolines that come in smaller dimensions might restrict your possibility of performing a range of exercises. Another feature we find just as important is the assemblage. One thing is for sure, the easier the trampoline is to assemble; the more likely you are to use it on a regular basis. Considering that you intend to store the gear whenever you’re not using it, it should be effortless to assemble. If you’re looking for a durable product that you can use for years to come, then your trampoline should be equipped with high-quality springs. This is a feature that indicates the construction and durability of a product. Albeit this might not be the first thing you look for in a mini trampoline, find out that it is, in fact, paramount. For example, if you want to use your gear on a non-carpeted surface, you ought to ensure that, as you bounce, the legs won’t mark the floor. So, the rubber tips have the role of protecting your floors from damage. Since we consider that user safety is a crucial matter when it comes to exercising tools, we would recommend you to select a product that balances all the right features, ensuring your safety, first and foremost. Leading an active lifestyle is crucial for promoting a healthy way of life. Rebounding is an effective choice for numerous reasons. Firstly, a mini trampoline is an exciting, fun way to incorporate a cardio workout in your routine, considering the number of calories burnt and other notable health benefits. It also provides you with the opportunity of exercising at home, whenever you’re up for it, or you have the time. Based on a study developed by the American Council on Exercise, bouncing on a mini-trampoline for about 20 minutes is just as healthy as running, but it feels much better while being more fun. Rebounding represents a type of intensity exercising that presents the same physical effects as running, biking, playing soccer, so on and so forth. Still, people who were part of the study indicated that the workout felt easier than it actually was. Studies also showed that jogging and rebounding presented similar heart rate levels and oxygen consumptions. The difference, however, was that rebounding showed better biochemical results while putting less pressure on the cardiovascular system, making it more efficient than running. The impact on the joints and bones is another element that makes rebounding more useful. Dr. Justin Klimisch, an orthopedic specialist, says that jogging is a form of high-impact exercising that should be combined, to avoid overuse. He also recommends rebounding. Consistent regular exercising enables you to manage your weight, improve your mood, your health condition, sleeping pattern, and lead an overall more active life. Nonetheless, consistency doesn’t mean repeating the same exercises over and over again. It’s highly recommended to incorporate a combination of exercises into your fitness regimen for the best results. Based on a study completed by NASA, rebounding for about 10 minutes is 68 percent more efficient for the cardiovascular system in comparison with running or jogging. In addition to that, because the legs are the ones that control the jump and movements, rebounding aims at strengthening the leg muscles. Also, since bouncing involves the implication of your hamstrings, calves, and quadriceps, your joints, ankles, and knees are reinforced. Rebounding will work your abdominal muscles without you trying too hard. Training consistently with your mini trampoline can deliver more visible results than sit-ups or crunches. Your back muscles, especially the ones around the spine, work in collaboration with your abdominal muscles, to empower your core. With every contraction, you improve your balance, and you maximize the wellbeing of your back muscles. Although rebounding doesn’t involve a lot of arm movement, your upper body can benefit from a trampoline workout as well. That is because your arms and shoulders play a crucial role in maintaining your body’s balance. Hence, the small stabilizer muscles will also be strengthened. The simple activity of rebounding has an immediate effect on all the organs in the body. This form of exercising has a beneficial impact on the functioning of the lymphatic system, whose mission is to support the immunity of the body. It also protects the body against bacteria, viruses, infection or diseases. When it functions properly, it thoroughly cleanses the body of toxins. Still, what does the lymphatic system have to do with rebounding? The action of rebounding enhances the movement of the lymph fluid, growing the G-force of the entire system. Having a clean lymphatic system is beneficial for ensuring the correct functioning of the metabolism. That is translated into an enhanced calorie burning capability. Rebounding will improve your metabolism while aiding you in burning calories. According to Jump Start Trampolines, exercising on a mini trampoline burns about 7.2 calories per minute, which equals 432 calories per hour. Based on research, rebounding is an excellent exercise that diminishes body fat. Therefore, this is an effective way of maintaining a healthy body weight while enjoying a fun way of exercising. Regular exercise is known to present a range of unmatched health benefits as well. Enhanced cardiovascular healtStudies based on highly trained athletes and middle-aged, sedentary women alike indicated considerable improvements in cardiovascular fitness, in the case of regular 30-minute trampoline workouts. The results were similar to those obtained in the case of traditional cardiovascular exercises. Those who performed approximatively 30 minutes of rebounding twice a week presented a considerable increase in leg strength and power. Gymnastic coaches reported similar results in their athletes’ training programs. Another noteworthy feature that makes rebounding beneficial is that they are fun, exciting, and much more accessible than conventional aerobic training. Experts highlight that bouncing appears easier, more pleasurable and less demanding, which makes it more available. The action of rebounding depends on the utilization of G-force since each cell in the body responds to the deceleration and acceleration. The up and down movements are, in truth, beneficial to the lymphatic system because it runs in a vertical direction. A study indicates that an increased G-force maximizes the activity of the Lymphocyte. The lymphatic system is responsible for transporting the immune cells throughout the body while supporting the immune function. As a result, rebounding is highly recommended by experts since it aims at boosting the body’s immunity and its detox capabilities. According to experts, rebounding grows lymph flow by 15 to 30 times. Another considerable health benefit connected to rebounding is enhancing the condition of the skeletal system. That is because the movements strengthen the tendons, ligaments, and muscles around the joints, diminishing the pressure exercised on the joints. That reduces the risks linked to osteoporosis and fractures. Rebounding is also a form of exercising that decreases stress hormones such as cortisol while boosting the levels of endorphins. One benefit worth mentioning is that rebounding is fit for users of any age. When this form of exercising is adjusted to the needs and individual specification of the users, the results are excellent. 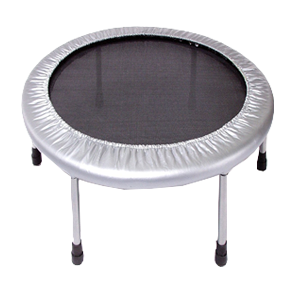 This heavy duty mini trampoline is a high-quality product that has been made to pass the test of time with flying colors. The arched legs provide you with sufficient support, and the use of high-quality materials, such as the vinyl cover, the steel frame, and polypropylene woven mat indicate excellent craftsmanship. As a result, this is a solid and responsive rebounder. It’s true that the price tag can be an impediment, but considering the built quality and its performance, this is a great product. 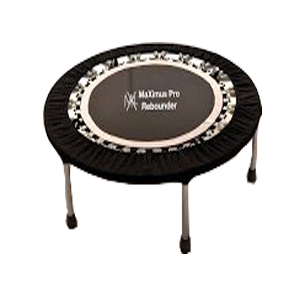 The Maximus Pro Rebounder is a correct choice considering its sturdy construction and the positive reputation of the manufacturer. It’s true that it is a bit on the expensive side, but the expression you get what you pay for perfection applies in this scenario. After our tests, we concluded that this is a qualitative product that behaves excellently for performing a variety of exercises. The DVD that accompanies the trampoline accounts for an excellent introduction to the realm of exercising, and, best of all, you can easily fold this when you’re not using it, for convenient storage. The best thing about this trampoline is that you can fold it twice, which makes it convenient when it comes to easy storage. Performing cardio exercises when using this trampoline places minimal pressure on the joints, while the maximum weight capacity reaches 300 lbs. This comes with a carrying case which means you can easily take this trampoline with you during your travels. This product can become your next personal trampoline if you’re looking for a budget choice. If you’re just starting to incorporate this gear into your working out routine, this product makes it easier for you to invest in a safe piece of equipment, enabling you to establish whether this form of exercising is right for you or not. Featuring all-steel construction and high-quality elastic straps, this is a well-made product that comes at a decent price. Merax trampolines are suitable examples of excellent craftsmanship and durable construction. The MeraxMini foldable trampoline is one of the least expensive models, but that doesn’t mean its performance is subpar in any way. The detachable legs are created for easy storage, and the thick padded cover indicates durability. It delivers the desired effects, improving your cardio and health status. Nonetheless, as you progress in your workouts, you might need another gear that is crafted for more challenging routines. 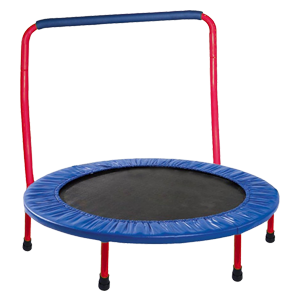 Excellent for indoor and outdoor use, this trampoline is effortless to use, being suited for children, in particular. It conforms to the strictest US safety standards, and it aims at enhancing your children’s co-ordination, motor skills, encouraging an active lifestyle. It also comes at a fair rate, being sturdy and well-made. And the last trampoline on our list of recommendations is this one manufactured by Pure Fun. Offering a generous surface of 38 inches, this is fantastic for recreational bouncing, for users under 220 pounds. Considering the affordable rate and the durability it provides, we can say that this is a great acquisition for the money. As you can see, finding the best mini trampoline is not that hard. You have plenty of choices at your disposal. You just have to find the product that fits your needs and space.